This isn't a total secret.. because anyone who knows me.. knows I wear extensions. I am pretty open about them and LOVE them!! About 5 years ago I got extensions for the first time.. I had close to bleach blonde hair..
& it was near impossible to get it to grow long..
switching over to brown hair and started wearing clip ins..
which I loved EVEN more.. way less maintenance! as opposed to practically every 6 weeks when I was blonde. so I still wear extensions. fyi // there are alot of links in this post..
and it will open in a new tab or window..
mainly for convenience and a friend recommended that brand from the get go. & the threading on the clips wear out fast! make sure your hair color matches identical to your extensions..
to see if I could skip the dying process and keep the lighter brown look..
and luckily it matched up good enough to where we didn't have to do any dying process! THEN here comes the important part!! My hair girl, Karen, then blends the extensions in with my own hair..
so you don't have blunt edges and they become a natural fit. I can wash, straighten, curl, whatever to my extensions.. They last about 4-6 months..
Then you will just want to add a fresh package of extensions onto your head! 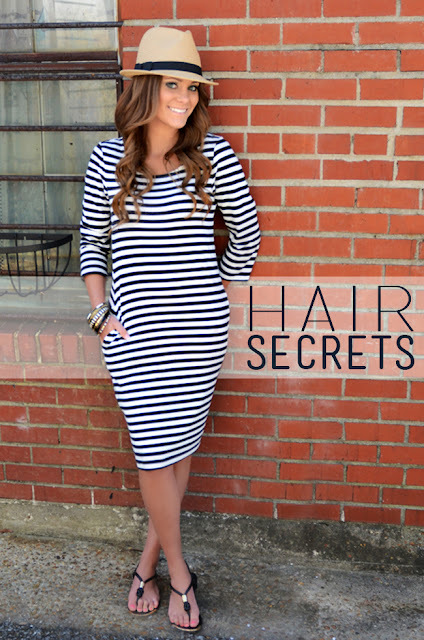 Even though I wasn't a total Luxy fan, they do have fun & helpful tutorials for hair! To get the cute top bun / sock bun look..
First off, You don't need tons of hair! your hair look like it is a perfectly shaped bun! around, tuck, and bobby pin if needed! If you want to add in some extra volume or are going on day 3 of no wash..
and it's always topped off cute with a cute headwrap! read above for my review on that brand..
ps. stay tuned for more of my beauty secrets this week!! Ive always envied your hair! totally couldnt tell they were extensions lol. you are so sweet! Thanks Lisa! This is great advice! I am very think hair too & I am trying to grow it long, I should probably invest in come extensions myself! wow! i never realized you had extensions! you know very well how to rock it lol. love your hair. You are one beautiful lady. Thank you! Love it! And I had NO idea you wear extensions. I have the same ones from sallys but unfortunately don't match my hair color anymore. Jet thought I'd let you know since it seems you're open minded to others input and want to grow long hair. Take care! I never knew you had extensions! I have always been a little leery of them picturing girls with blunt cuts and clearly long chunks of fake hair but yours looks seamless and perfect...might need to take another look at them! Dumb question, but do you keep them in your hair, or reapply every morning? I have the one piece one from HairDo, and it hurts my head after a few hours, so I have to take them out and put them back in every morning. Oh I’m so glad you posted this. I am sure they will really helpful! Thanks for sharing these tips!